" (Italian brothers) from its first verse and it's also known as Inno di Mameli (Mameli's anthem) from the name of the composer who wrote the text. The anthem was created in 1847, during a climate of patriotic ardour, just before the 1848 war against Austria. It became a favourite song during Risorgimento (the political period in 19th century in Italy which eventually led to the country unification in 1861, with Rome as its capital city in 1870). The two authors of Italy national anthem were both from Genoa, convinced liberal and republican. Goffredo Mameli, born in 1827, was a twenty year old poet when he wrote this poem, originally titled Il Canto degli Italiani (The poem of Italians). At that time he had been taking part in political demonstrations in Genoa and since then he devoted himself entirely to the cause of Italy. In 1848 he was in Milan fighting against Austrians, then in Genoa working with Garibaldi and finally in Rome. There he was wounded at the left leg, which had to be amputated due to a gangrene. A few months later, he died following an infection, at the young age of 22. 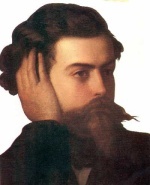 Michele Novaro was born in 1818 and studied composition and singing. 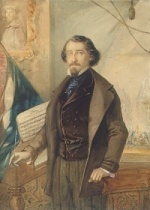 He used his skills as a composer to serve the cause of independence, setting many patriotic songs to music and organizing shows to raise funds to support Garibaldi's enterprises. He had a modest character and didn't take any advantage from his most famous composition, not even after the unification. In 1864 he founded in Genoa a Choral School and dedicated himself to it. He died in poverty in 1885 and later some former pupils of his had a monument built in the Genoa cemetery of Staglieno. How was Italy national anthem created? A friend and biographer of Goffredo Mameli, Carlo Alberto Barrili, he himself patriot and poet, tells that he was in Turin at another patriot's home, with other friends, talking about music and politics and playing at the piano several new anthems composed in various parts of Italy. At some point, a new guest arrives, a painter, and hands a piece of paper to Michele Novaro, while saying it was from Goffredo. Novaro was deeply touched by what he read and sat at the piano, trying to find some music for those words. Not happy, soon after went home. There, without even taking his hat off, ran to the piano, full of excitement, and jotted down what he could remember, knocking over the lamp on the piano and the sheet. That was the origin of Italy national anthem. Italy national anthem has several verses, although usually it's only the first one that you are likely to hear played at international events and which is known to most of Italians. Here is the first verse with the English translation. She crowns you with glory. Listen to Italy national anthem, watch this video shot in Rome, when Italy won the football world championship in 2006. Visit the rest of this website to learn more about Italy.